I never started studying scripture, or thinking theologically because I have aspired to becoming a biblical exegete of note, or a Christian Dogmatic theologian of recognition; I came to reading scripture consistently over and over again because I became aware of my great need for a Savior! I am a sinner, as the Apostle Paul would say, ‘the chief of sinners’, and I need a Savior. There is nothing good that dwells in my flesh, it is altogether wicked and evil, I cannot even understand it. I am a desperate fool who needs saving moment by moment, if I try to do anything apart from Jesus, I can’t; I fall into sin moment by moment when I try, when I think I stand and think I am something when really I am nothing—apart from Jesus that is!— I am prone to make studying the Bible and Theology idols, things that become ends in themselves; things that become my high places; things that I have named Jesus, but Jesus really isn’t present, at least not in his resurrection power. My desire is to be holy as He is holy, and yet I wonder who will deliver me from this body of death?! This is why I ever came to Jesus, not because I wanted to be identified with one badge in place of another, but because at the deepest part of my heart, it is rock hard! I came to Jesus only because he first loved me, that I might love Him; He gave me His heart of flesh that is soft and sensitive to his kind of life, the kind of life that He shares with His Father; so I came to Jesus not out of my own wit—my own wit is what leads me to the depths that I have been describing above—I came to Jesus because He chose to do what I would NEVER do left to myself!! I can empirically substantiate this because the vestiges of this old man of death are still present and haunt me everyday; I can see this old nature, this rock hard heart cold to the life of God still active, at points, in the members of my body, and it sickens me! But this is why I study the Bible and the God who has given us it in Christ; it is because He has convinced me through His Son that without Him I can do nothing; meaning that left to myself I will do everything that my inward curved heart desires! I am confessing this because the Lord is convincing me once again that I am a sinner in need of a Savior. If this is not at the bottom of what’s going on in our theologies and biblical studies—our desperate and real need for God in Jesus Christ—then it all means nothing!!! Because at the ground floor of all of this is the reality of God’s life of love which He has invited us to participate in through the finished work of Jesus Christ on the cross, grave, resurrection, ascension, and consummation of all things! We need Him, I need Him, because I can only truly love the way I was designed to if I am brought into the life that God had always intended for us to live in and through His Son; the firstborn from the dead! amen. PS. 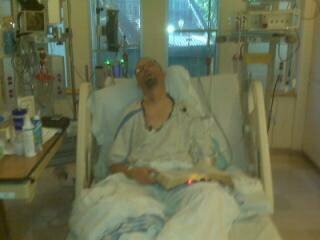 This picture above was taken of me after I had just had my cancer resection surgery on May 6th, 2010 (I am in ICU recovering at this particular moment in time). We didn’t take many pictures of me during this season, but I like to see this picture of me (now), because it reminds me of just how weak I really am in myself. I don’t have control, and I am fully dependent on the control of Jesus Christ, in this picture, and even in pictures of me now, wherein I look fully healthy (and I am, praise the Lord!). Anyway, I am obviously in a reflective moment as I write this. Peace.